256 pages, 9.25 x 6.5 inches, stitched, softcover, dust jacket, spot colour with fore-edge printing. 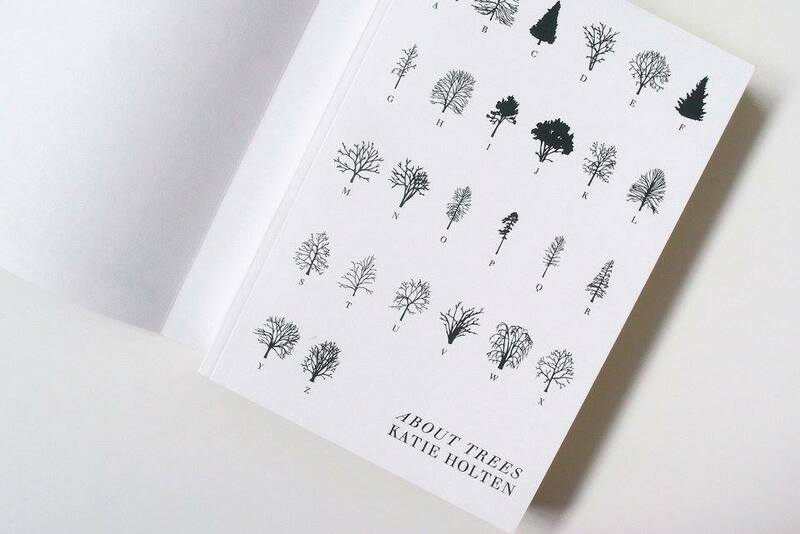 Font: The book is typeset in Walbaum and Trees, an original typeface created by Katie Holten. The Trees font is available to download for free here. About Trees grew out of a series of drawings made for the group exhibition About Trees at the Zentrum Paul Klee in Bern, Switzerland, October 17, 2015 – January 24, 2016. Limited edition offset prints available here. Texts by Andrea Bowers, Inger Christensen, Tacita Dean, Amy Franceschini, Charles Gaines, James Gleick, Fritz Haeg, Amy Harmon, Natalie Jeremijenko, Eduardo Kohn, Elizabeth Kolbert, Irene Kopelman, Ursula K. Le Guin, Robert Macfarlane, Arianna Occhipinti, Katie Paterson, Pedro Reyes, Robert Sullivan, Rachel Sussman, Nicola Twilley, Gaia Vince, Aengus Woods, Andrea Zittel and others.